At the start of this month I started my Veganuary journey, which now means I'm now over a week into living off an entirely vegan diet and I haven't starved - wahey! 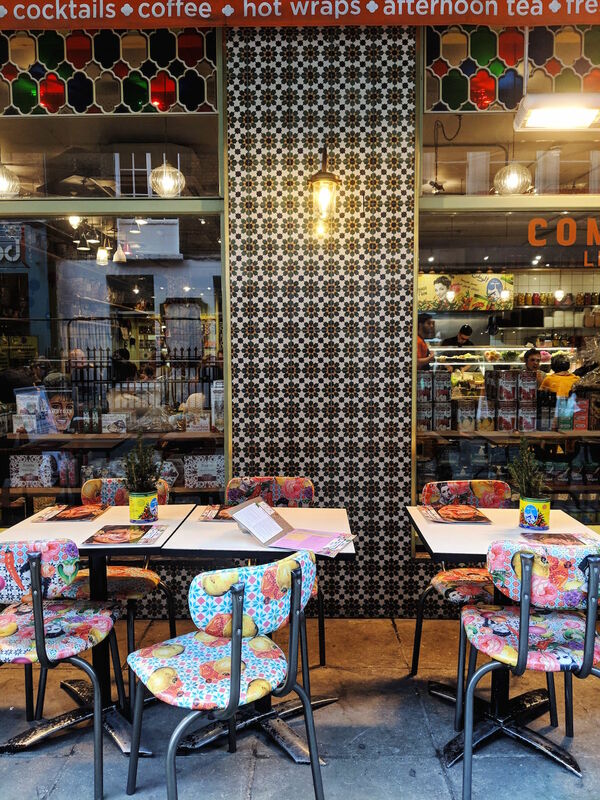 One of my first dining out experiences was last weekend at day-to-night Lebanese restaurant, Comptoir Libanais, which can be found in various locations across London. 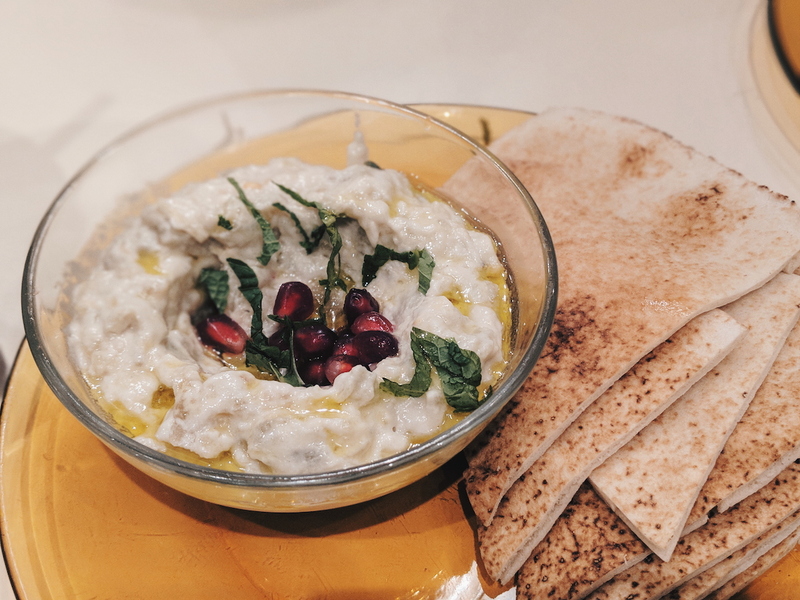 This January, in support of the Veganuary movement, Comptoir Libanais have launched a incredible vegan feasting menu for two, which costs just £19.95 (less than £10 per person). 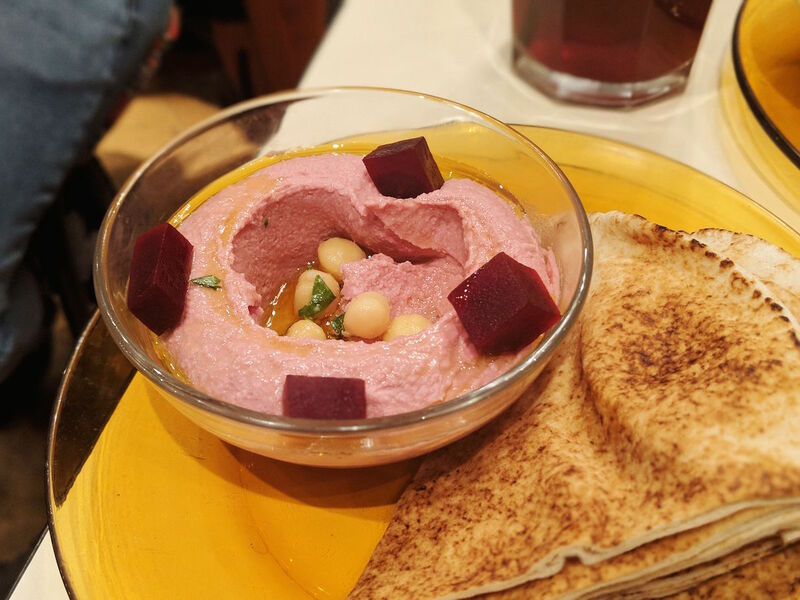 When I was offered the chance to taste the brand new menu, I grabbed one of my best vegan gal pals, Laila, and headed down to their Soho branch on a Saturday afternoon. 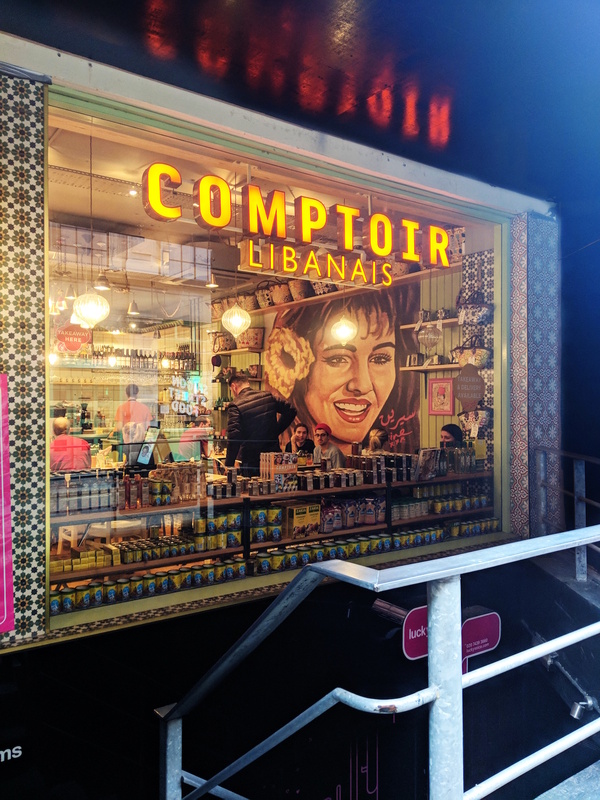 Comptoir Libanais offers a casual yet colourful dining experience with a vibrant, eclectic decor that is supposed to reflect the owner's (Tony Kitous) childhood at his grandparents' house. 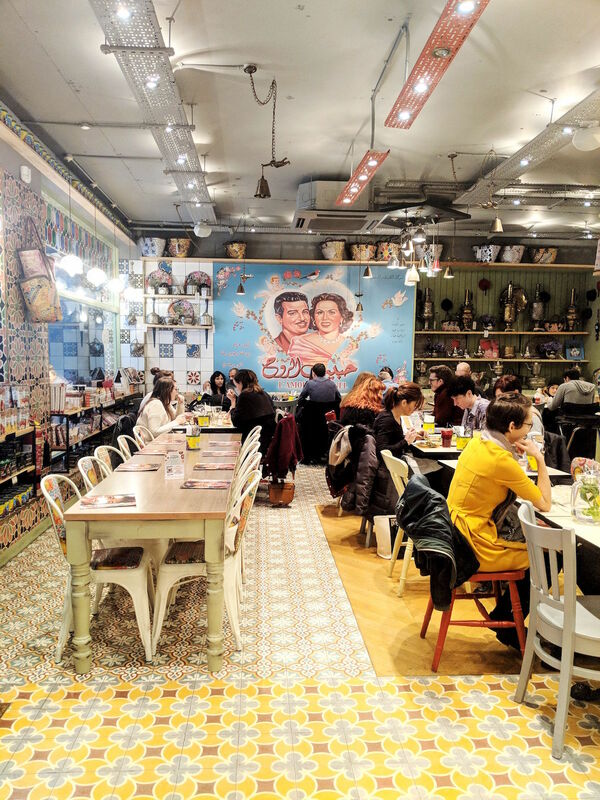 A vintage-inspired movie poster donning the smiling and welcoming face of Arabian actress, Sirine Jamal al Dine, can be found featuring at every restaurant, including on the menus, the takeaway bags and upon the walls of the restaurant. 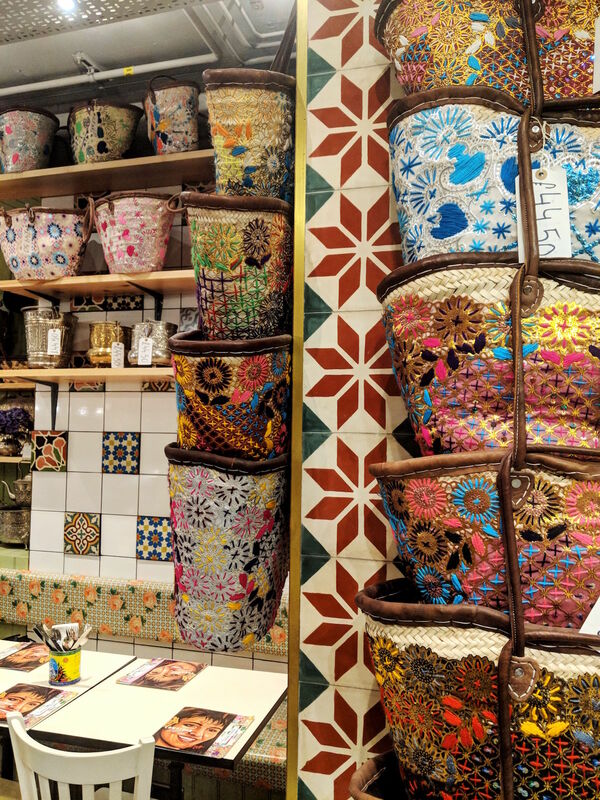 Vibrant and decorative ceramic tiles inject the colourful character of the restaurant's branding, whilst beautiful woven, embroidered bags adorn the walls and other products from the restaurant chain, including recipe books and sauces, line the shelves and are available to purchase in case you fancy getting creative in the kitchen at home. Everything about the decor is wonderfully eclectic yet each feature somehow compliments one another! The vegan feasting menu begins with four starters including a flavoursome Beetroot Hommos (houmous served with warm pitta bread), Baba Ghanuj (smoked aubergine, tahina & lemon juice with pomegranate seeds served with warm pitta bread), Falafel and Freekeh (smoked green wheat, wild rocket, vine tomato, spring onion, apple vinegar & mint dressing). 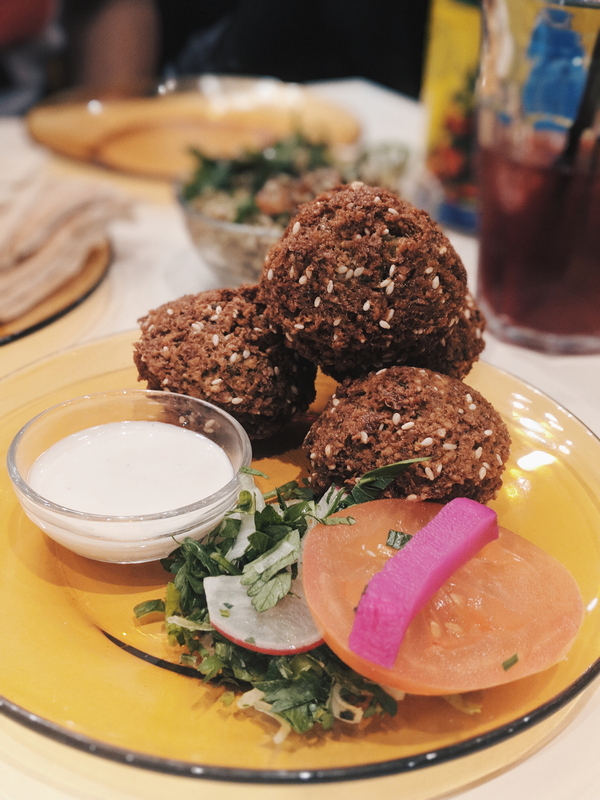 The falafel were huge, warm and crispy accompanied by a tahini sauce, whilst the baba ghanuj and hommos were creamy and moresome. Our mains arrived before we had even had a chance to finish our starters meaning we quite literally a feast laid before us to pick at and natter away whilst we did. 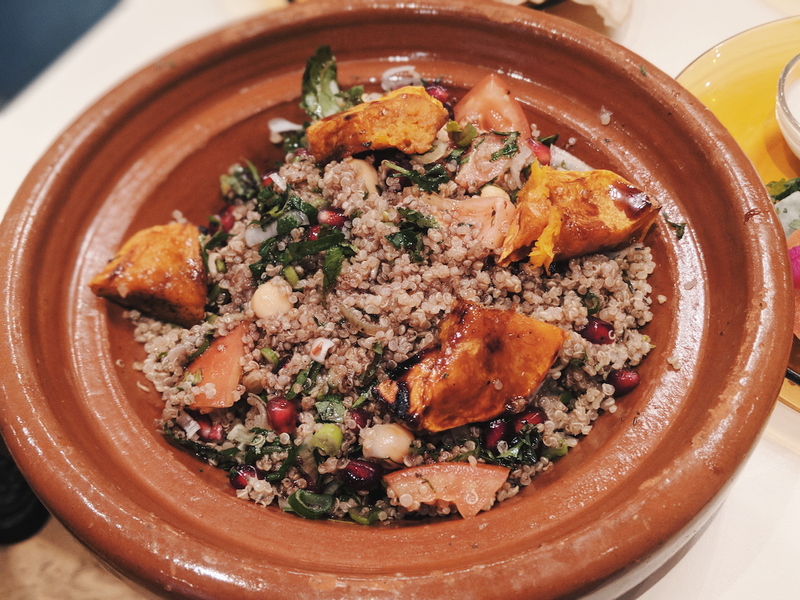 The main included in the menu are the Quinoa & Pumpkin Salad (chickpeas, vine tomato, fresh mint, topped roasted pumpkin, apple vinaigrette & pomegranate dressing) and the Aubergine Tagine (baked baby aubergine in a rich tomato & chickpea sauce garnished with mint yoghurt). Whilst the tagine was my personal favourite out of all of the dishes, they were all delicious and despite our best efforts we couldn't finish the food before us because there was just so much food! 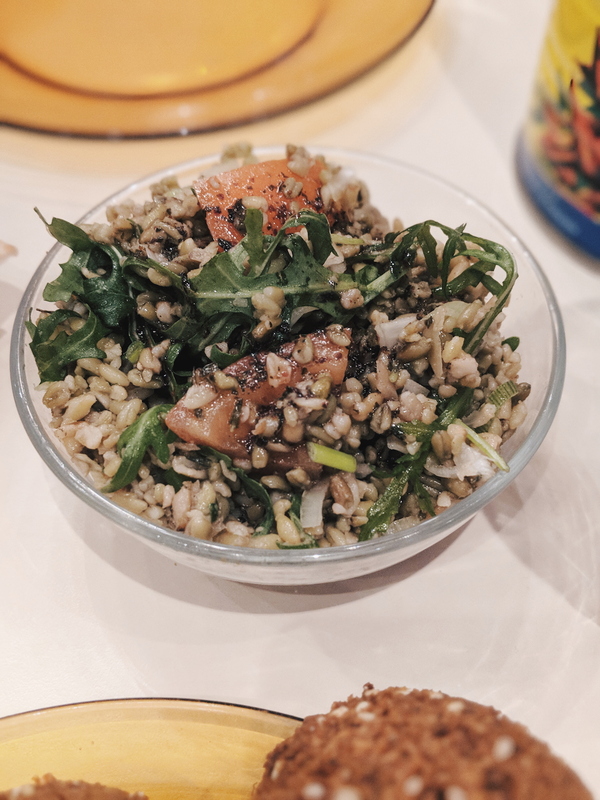 Luckily, we were able to nab a takeaway box to house our remainders because I'm very much against food waste... especially when it tastes so good too! A dessert is also included in the feasting menu but I didn't actually realise this until re-reading the menu at home. Unfortunately during our visit, no one mentioned the dessert on offer so we left without having the opportunity to taste it. This may have been because we didn't manage to finish the first two courses though! I've read that the dessert option is a Rose Coconut Mouhalabia - a traditional Lebanese milk pudding with rose flavouring and topped with pistachios. It sounds bloody delicious so I'll definitely be back to try it at some point! 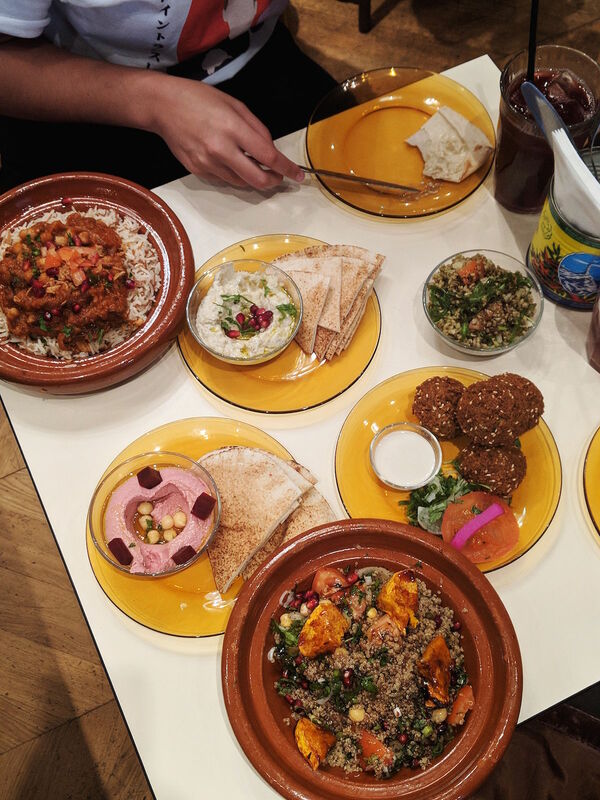 If you're a full-time vegan or taking part in Veganuary or maybe you just fancy a plant-based feast then head down to one of the many Comptoir Libanais branches across London. Disclaimer: I was offered a complimentary meal in exchange for an honest review. All words are my own. Wow! This looks so colourful and delicious. I try and eat veggie a lot more these days so I'll have to check this out. Love the sound of the tagine.